If you send lot of email messages using Gmail service, then you must be spending lot of time in ‘Sent Mail’ section trying to find and look for specific sent message(s). Ideally, every sent Gmail message can be found in ‘Sent Mail’ section. To make things easier for sent email message(s) tracking and follow, now you can filter them using combination of star and labels. You can assign specific label or star email message while composing and before you hit the send button. 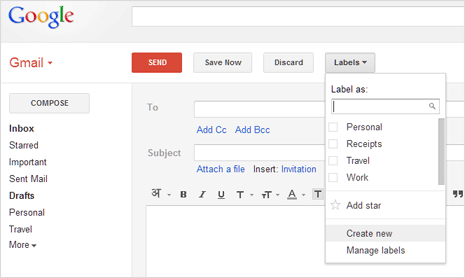 Once the email message is sent, you can track it by clicking assigned label location on left side panel of your Gmail inbox. 1. To get going, click Compose button for writing a new email message. While doing this click Labels button at the top. Here you can select any existing label or create a new label. You may also use star feature instead of using text labels. 2. Once you select specific label for this ougoing email, click send button for sending this message. From now on to follow the sent email message, click the assigned label listing on left pane for easy tracking.